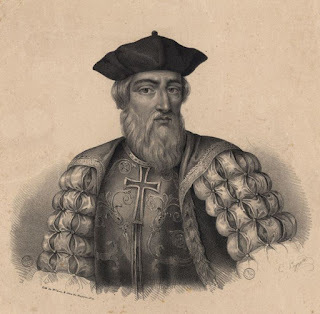 Admiral Dom Vasco-da-Gama (c.1469-1524)-I, Portuguese navigator, arrived in India. He sailed around the Cape of Good Hope to Calicut, Kerala with three vessels and was the first Westerner to sail to India from Europe. In 1497 Vasco da Gama set off on the first ocean journey directly from Europe to India. Other explorers had made it around the Cape of Good Hope, but Gama was the first to successfully cross the Indian Ocean and make port in Calicut. In that sense, Vasco da Gama was the first to discover a sea route to India. His voyages to India opened up the sea route from Western Europe to the East by the way of Cape of Good Hope and thus ushered in a new era in world history.